NATICK, Mass. (Jan. 30, 2012) -- Natick Soldier Research, Development and Engineering Center has contracted for several efforts with the American Sheep Industry Association and its subsidiary, Sheep Venture Company, to develop, test and evaluate wool fabrics for combat clothing. The decision to take a second look at wool as a high-performance fiber was due to improvised explosive device, or IED, issues in Iraq and Afghanistan. Wool, due to its molecular structure, is very resilient, fire-resistant, has good strength, and is durable. It dyes very well, retains its color, and has very good moisture management properties. "We can enhance wool's inherent properties by engineering high-performance fiber blends and fabric structures. It all begins with the wool fiber fineness, where some breeds of sheep and what they are fed directly affect the wool fiber diameter and flexibility," said Carole Winterhalter, textile technologist for NSRDEC. "In the military world, Natick is recognized as working on cutting-edge technologies in support of all Soldiers, Sailors, Airmen and Marines. Work done at Natick is thorough and credible," said Mitchell Driggers, program manager for Sheep Venture Company, or SVC, and government contracting consultant of the American Sheep Industry, known as ASI. 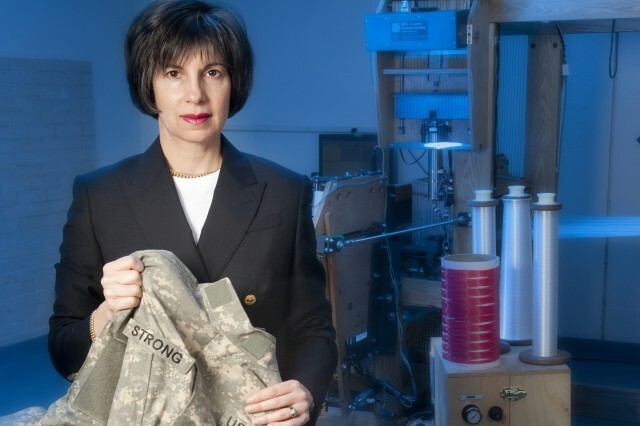 "Natick provides the expertise of textile technologists to engineer optimized individual clothing for the field," Winterhalter said. In 2009 NSRDEC selected three organizations for Phase I Small Business Innovation Research contracts specifically calling for shrink-resistant treatments for wool. SVC received the Phase II contract and created different wool shrink-resist techniques through chemical and enzyme-based technologies. Subsequently, the sheep and wool industry spent its own funds to install a manufacturing line with energy-efficient equipment to run the shrink treatments. This line accommodates multiple shrink treatment methods. SVC's washable wool line exceeded its production by more than 40 percent in the first year, and the company expects to double its production this year. "The work done with Natick Labs is important because ASI is able to better understand the needs of all of the military services," said Rita Samuelson, wool marketing director for ASI. "Together, we can develop products that are functional and valuable to our servicemen and women." ASI, a national trade organization supported by 45 state sheep associations, represents more than 82,000 sheep producers. "Our ranchers prefer to sell their wool to domestic companies, and so we are continually looking for ways to increase American wool consumption at the mill level," Driggers said. "The innovations of Carole and her team put wool into a very competitive position that should lead to an overall increase in American wool use by the military. Additionally, new products introduced to the military have immediate commercial applications that further improve business for everyone involved with U.S. wool." The U.S. wool industry exports approximately 65 percent of American-grown raw and semi-processed wool to overseas markets, and 10-15 percent is used by the domestic textile industry. The U.S. military usually consumes 20-25 percent; a slight increase will present significant business improvements to wool producers and manufacturers. "These innovations help to develop products for now and the future, to adapt to the ever-changing needs of combat and tap innovation that is available commercially for developing totally new products," Samuelson said. "The U.S. military is an important and key customer for U.S. sheep producers. Having such a large customer in the U.S. helps to sustain our industry by building demand for our product." "So much of the textile industry has been lost to foreign countries," Samuelson explained. "But, most importantly, foreign fabrics/wool decreases the United States' ability to respond locally and to use U.S. products and workers." "Over the years in a systematic effort, we looked at various aspects of the concept," said Winterhalter, "first developing the camouflage recipe, then simple fiber blends and fabric constructions. Now we're looking at long-staple yarns, and wool shrink-resist treatments." Spinning long-staple (four-inch) wool into worsted yarns with Nomex and Kevlar fibers from DuPont was done through NSRDEC and SVC for flame resistance and durability purposes. "We believe we'll be able to make a fabric that is much stronger with the long-staple worsted yarns," Winterhalter said. "We've already demonstrated a 20 percent increase in yarn strength over the previous short-staple yarns." Engineering products such as fire-resistant, or FR, fabrics is done to meet Soldiers' needs. Improving the protection and other performance characteristics of clothing is important, especially in Iraq and Afghanistan. "Through these different parameters, we can engineer high-tech protective clothing made from environmentally friendly natural means," Winterhalter said. "We hope these fabrics will be used across the board for FR applications, just as the nylon/cotton blend has been the all-purpose combat uniform fabric." SVC was awarded a three-year contract to develop FR fabrics for the future. SVC will take the aforementioned concepts and combine them. The company will look at wool and wool blends and survey FR fibers from all over the world, as well as gather the various services to find out what their FR needs are, to ultimately produce fabrics and garments that can be tested for effectiveness by service members. "Wool does not melt or drip and has significant fire-resistant qualities, both of which can help protect Soldiers from IEDs," Samuelson said. If these fabrics are ultimately successful and adopted, future products will be made entirely in this country with U.S.-grown sheep, as opposed to some exemptions that have been made in the past. Wool is being revitalized to suit the needs of the Soldier, and this growing industry might be one of the ways in which the U.S. can continue to create jobs at home to serve those at home and abroad.